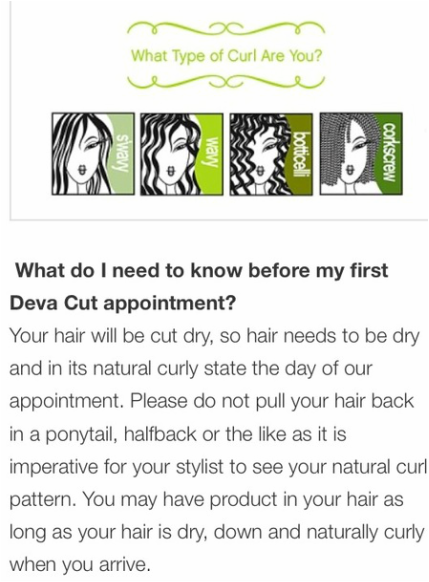 Preparing for Your Deva Cut - IMPORTANT!!! Will my hair look uneven with the Curly Cut technique? The Deva cut is for people looking to wear their hair curly the majority of the time. It is cut in a “waterfall brick lay” pattern, so when the curls are dry there’s no chunky, awkward layers. The cut removes weight from the inside so you don’t end up with super short pieces. If you want to straighten your curls, use a round brush and a big barrel curling iron to bump ends under. Why is there so much gel? You need enough gel to seal down the cuticle- it must be applied to soaking wet hair (do it right in the shower). If the hair is dripping, you can squeeze out the excess with an old cotton t-shirt. Let the hair dry until you feel a stiff cast. Once hair is dry and has formed a stiff cast, squeeze out the stiffness. You will see beautiful, curly hair! Why is lathering shampoo bad? Detergents or heavy use of sodium lauryl sulfate will dry out curly hair. Most curly hair is thirsty- if you want to keep the pH balanced and keep the moisture in your hair, then DevaCurl’s No-Poo is the way to go! It will help you achieve the optimum level of moisture for your hair. If you get very straight on the top of your head and curly on the bottom, clips make all the difference. *Clips are the BEST way to sculpt your hair and make it stay! Does Curls and Company understand “tight or 4c” curls? Yes- we get it! However, if you know that you are going to go back and forth between straight and curly styles- the Deva cut is not for you. Once a month we offer classes where we teach you how to style your curly hair! Sign up and enjoy great food, drinks and curl education! Do you do straight hair? Can I wear my hair straight with Devacut? YES! We do straight hair and LOVE it! If you are going back and fourth with curly/straight styling, you will not have as consistent of a result with healthy bounce looking curl's as you would with wearing your hair curly all the time (refer to Curly Girl Book by Lorraine Massey). That being said we can teach you the techniques of curly styling on a traditional cut. Do I need a Junior Stylist or a Senior Stylist? Junior Curly Stylist is best if you just want to try something new and fun in your curly life! Are “natural products” always best? BEWARE! If you have blonde or white hair natural oils can turn it yellow- yikes! *These also cause build up, which will result in white flakes on your hair when combined with other products. The first style question comes from a woman who, thanks to a unique problem, hasn't cut or styled her curly hair in years. In response, Curls and Company owner and curly-hair expert Cally Raduenzel dishes on her favorite gel, the best layering techniques, and why you should throw away your brush. "Help! I have a problem. For the past 10 years, I haven't been able to cut or style my curly hair, dating back to an unfortunate incident during my 12th birthday party. Even at that age I had a rather large head, the kind that makes people say, "Cool! A padded wig!" So when the waiter at my favorite Mexican restaurant, Sombrero Rojo, crowned me with my birthday sombrero, it stuck. My hair has been trapped in the second story of a child’s sombrero for a decade. It wasn’t so bad. After a while, I barely noticed it, unless I returned to Sombrero Rojo, where they mournfully gave me free refills on select sodas. This year, though, on my 22nd birthday, came freedom. My head had finally grown enough to split the sombrero right down the middle. I was ecstatic—until I realized I had no idea what to do with my hair, which is so long and curly now that I often lose my balance. Do you have any tips for how to cut and style my curls?" Cally is an advocate of Devachan's dry-cutting technique, which was designed for curls—it eliminates guesswork about how far the curls will spring up as they dry. But if you can’t find a dry-cutting salon, wet cuts don’t have to be a disaster. Cally says there are three curly cuts you want to avoid: the earmuff, the teepee, and the Christmas tree. For a more flattering silhouette, request a little layering, focused in the hair’s middle section. “The center, underneath the occipital bone, is the best place to do your layering," she says. "When your hair falls over it, it’s almost like you’ve built in suspension to lift it up.” She also recommends asking your stylist to pull your layers forward, which creates a cascading effect. Cally recommends investing in Devachan’s styling gel. “I don’t like to use the word gel,” she says, “because people think of stiff, Wall Street, tight-scary curls that will put your eye out.” She says Devachan’s formula is “more like a glaze,” and never leaves hair feeling crunchy or hard. Cally also advocates for sulfate-free shampoo (the brand here is less important than the ingredient list). These shampoos don’t lather, which makes some people think they're not as effective. But Cally says suds aren’t actually cleansing agents—they just signal the presence of sulphates, which damage and dehydrate hair. Cally says that styling your curls doesn’t have to be a huge production, as curly hair’s reputation for being hard to manage is overstated. There are some caveats to this plan—don’t brush or comb your hair while it’s drying, for example. Curly hair is most vulnerable to damage when it’s wet, and in the long term, brushing wet hair will cause frizz and abrade your ends. Cally recommends detangling hair in the shower instead, with your fingers and some conditioner. As far as your washing regimen, Cally recommends shampooing no more than twice a week, but wetting and conditioning your hair every day. There you have it. You’re ready for a life of bouncy, hat-free curls. Do not waste it.